In the late spring of 2017, the Latinx Caucus of the Green Party of the United States (GPUS) released a statement by co-chair Darlene Elias, in support of the actions of the New York Puerto Rican Day parade, which noted that “it is now to the point that it [Puerto Rico] can no longer sustain itself and a humanitarian crisis now exists. . . .” That statement was prescient as the situation has become exponentially worse after the devastating destruction from Hurricanes Irma and Maria. The GPUS platform has called for Puerto Rican independence as the only solution that would allow the Puerto Rican people to address their own problems. While it could require a history course to understand that Puerto Rico has long been treated as a colony, a brief outline may help to understand. Originally populated by native Taino people, Columbus claimed Puerto Rico for Spain late in the 15th century. It endured various forcible takeovers by other European nations, but Spain again controlled it in the late 19th century. Meanwhile, after the introduction of African slaves and waves of Iberian immigrants, the culture had become creole Hispanic. After the Spanish-American war, the United States took it over. Puerto Rico is now known as a “free associated state”, a change, which occurred in 1952, following an uprising for independence in 1950 and international pressure. 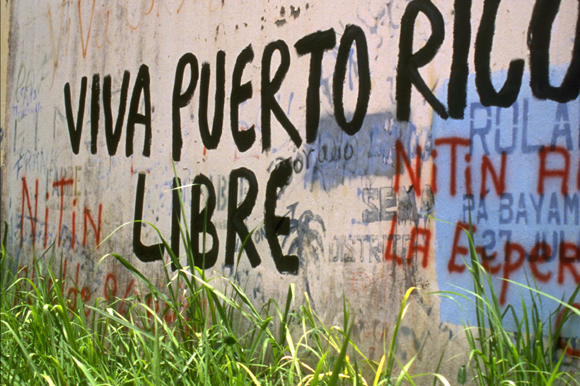 Individuals are U.S. citizens, and some have fought and died in U.S. wars, but many Puerto Ricans believe the island still exists under colonial rule. Taxes are imposed on imports that make consumer goods two to three times more expensive than on the U.S. mainland. Corporations do not pay taxes on the profits they extract from the island. While the Puerto Rican government is $73 billion in debt, corporations have extracted over $600 billion in profits in recent years. Even a modest tax would have eliminated the debt. GPUS calls for forgiving the debt and ending the tax on imports. Though Puerto Ricans are U.S. citizens, they cannot vote in the presidential election and they are not represented in Congress. That was before the island was devastated by storms. Now it is even more obvious that debt repayment will not be possible. However, the foot-dragging repair efforts seem to be pointing to another nefarious solution. Tens of thousands of Puerto Ricans have given up and have migrated to the U.S. mainland. Some suspect that the goal is to simply wait until many leave. While the Puerto Rican government is $73 billion in debt, corporations have extracted over $600 billion in profits in recent years. Even a modest tax would have eliminated the debt. Hector Lopez, a Puerto Rican who has been active in the Connecticut Green Party for over 20 years, adds “Now they want a Puerto Rico empty of Puerto Ricans so that they can build a paradise for themselves, no Puerto Ricans allowed. This was done in Hawaii and now the Hawaiians find it too expensive to live there in their homeland. By the way, gentrification has already begun. When speaking before the U.N. committee last June, Darlene Elias pointed out “the Puerto Rican people are despondent and have lost faith in the political system. Only 23 percent of residents living on the island showed up to the polls to vote in the most recent plebiscite. This is a very low number when you take into account that Puerto Rico consistently has high voter turn out. It is also by far the most telling statement of the Puerto Rican people’s desire for independence.” Those preferring independence boycotted the plebiscite.